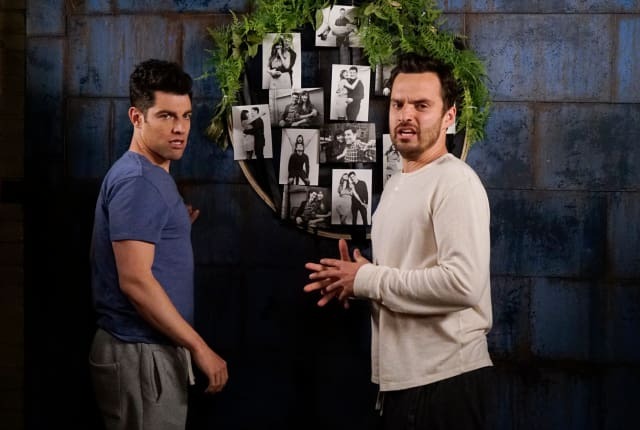 On New Girl Season 5 Episode 21 and 22, things finally get underway for the wedding between Schmidt and Cece, but they ecounter a few bumps along the way. When you watch New Girl Season 5 Episode 21 and 22 online you'll realize how important it is to communicate when trying to surprise your bride. The night before the wedding Jess and Cece have a girls night in, but Jess is surprised to find a ring in Sam's coat pocket. After talking with Cece, Jess makes the decision she will say yes if Sam does ask. Sam tries to get some private time with Jess, but she gets nervous and instead suggests everyone in the loft play True American. Sam and Jess eventually get some private time together and Sam tells her he wants to break up with her because he has feelings for Diane. Jess is relieved because she wasn't going to say yes to Sam and Sam tells her it's because she still has feelings for Nick. Meanwhile, Schmidt comes up with the brilliant idea to fly to Portland to convince Cece's mom to come to the wedding. Unfortunately, he didn't realize she was heading to California to surprise Cece. Schmidt is stuck for hours on the plane and isn't able to make the wedding, but tells Cece to enjoy the party. Want to see what else happens? Go watch New Girl online now via TV Fanatic and catch up on the entire season. On New Girl Season 5 Episode 21 and 22, things finally got underway for the wedding between Schmidt and Cece, but they encounter a few bumps along the way.